Another Beautiful Day in Paradise. We had a 10-15 mph NE wind and it was in the high 60s. 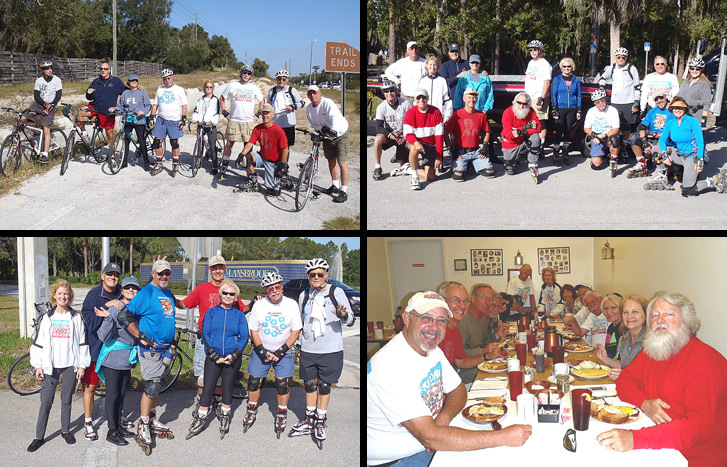 We did the Park, the residential area to Lake Tarpon and then out to the John Chesnut Trail on Lansbrook Parkway. Absentees Mike M, Dennis & Ellen, Mary B, Linda S, Joe W and Herb E came. Welcome back. It was a little work heading North but wonderful returning South. We basically had two groups. One did all the way to the end and back for 14 miles and one group came back at Lansbrook Parkway for 10 miles. Some where along the way, Mike M pointed out his back yard. We past Carlos and Claudia but never saw them again. There were 7 bicyclists. We had 6 people renew their Sponsorship this last week. They were Andrea W, Dennis & Ellen H, Joe & Mary W and Steve G. Thanks all for the web site support. If you haven't renewed your Sponsorship yet, it's time. We Brunched at Eve's Family restaurant as planned. We got right in and could all have sat at one big table but we took one big and one small table to give everyone a little more room. We got several coffee pots placed on our tables so we had plenty of coffee. Service was good and fast. We got in and out within 45 minutes. Rob didn't love what he had to eat and only gave his Brunch a 9. However several others gave there's a 9.3.